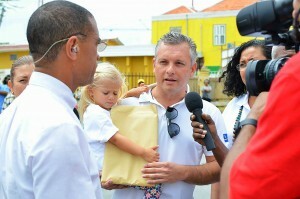 WILLEMSTAD - There was the usual carnival-like atmosphere in Curaçao on Friday, as 14 political parties wishing to participate in the early elections of April 28 presented their respective lists of candidates. MAN won the regular election in terms of votes last October, but ended up with the same four Members of Parliament as both MFK and PAR. The party’s supporters are now calling for eight seats. “Movementu Progresivo” (MP) did not make a lot of noise, but party leader Marilyn Moses was full of confidence. The pink party’s new number two candidate Gassan Dannawi (ex-MAN) could not be present due to other commitments. Omayra Leeflang’s “Un Kòrsou Hustu” came with about 30 persons waving purple flags and blowing whistles. “No longer fear among pensioners,” they chanted, asking to give her more than one seat this time. 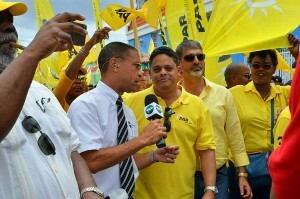 DP’s leader Roy de Freitas was accompanied by about 20 supporters. Last year the party had submitted an all-female list but failed to earn a seat. He said they want to bring down consumer prices, because raising wages only leads to inflation. A similar crowd showed up for “Movementu Kòrsou Prome” (MKP) of former PS-minister Rene Rosalia. Just like DP, his party will need the endorsement of 792 voters in a pre-election round March 18 and 19 to qualify because they currently don’t have representation in Parliament. The same goes for PUSH (“Pueblo Uní Solido i Hustu”) led by Ydeliene Heerenveen, which held a press conference to explain that it involves 12 young professionals who believe they can make a difference. Caretaker Minister Suzy Camelia-Römer is participating with her new party “Partido Inovashón Nashonal” (PIN) after breaking with PNP, because Humphrey Davelaar remains its leader even though she got almost double the number of votes he did in October. At number two is Renox Calmes of “Movementu Speransa,” which joined forces with PIN. “Pueblo Soberano” (PS) is still led by Jaime Cordoba, despite the fact that the party went down to just two seats in the most recent election. New is veteran union leader Oscar Semerel, who anchors the list. “Korsòu di Nos Tur” (KdNT) surprised many by earning three seats in its first election last October. With independent (former PAR) Parliamentarian Eduard Braam now also on the list, party leader Amparo dos Santos hopes to double that number. Replacing Camelia-Römer at number two on the PNP-list behind Davelaar is caretaker Minister Ornelio “Kid” Martina. Former commissioner Gimena van der Gen will be making a political comeback at number five. MFK’s list now includes PAS-leader Charles Cooper at number two. His own party is not participating in the snap election so he has joined forces with the MFK led by Gerrit Schotte this time. The Supreme Electoral Council had actually counted on 13 parties, but just before the 4:00pm deadline Josefina Jospeha showed up to submit a list with her as the lone candidate. “Liberalismo Klásiko Komunidát di Kòrsou” (LKKK) wants to see more accountability in government. MAN, MFK, PAR, KdNT, PS, PNP, Hustu and MP are currently in the legislature, so they don’t need to qualify. The other six do. Meanwhile, two proposed candidates of “Kòrsou Solidario i Duradero” (KSD) went to court because only persons who are eligible voters 30 days before Nomination Day may participate. The duo had been residing in the Netherlands but moved back to the island after hearing about the early elections and registered on respectively March 7 and 8. However, a decision was taken on February 12 to dissolve Parliament effective May 11 and hold snap elections on April 28. Consequently, the Supreme Electoral Council (SEC) on February 17 announced that the voter registry had closed per February 8, thereby excluding the two. While this was thus done retro-actively, the Judge saw no reason to intervene. The requirement does constitute a limitation of suffrage, but is legally prescribed and neither disproportional nor unreasonable in the interest of an orderly democratic process.